Why should my company choose Managed Training? It can be challenging to stay up to date with all of the changes to the products that you use daily. Our LMS(Learning Management System) experience creates customized learning paths, videos, assessments, live trainings, and more. This is a great platform that can connect many different learning styles. Gamification is also utilized to ensure that content is understood in a practical manner. You will also have unlimited access to our instructor led training with our Greystone Technology Training Manager to engage with and understand your products in a more meaningful way. – One live training event can increase productivity by 1 hour per week. – One video playlist (skill path) can increase productivity by 18 minutes each week. What are the benefits my team will experience? The main focus of our Managed Training offering surrounds Office 365 products and security topics. The more knowledge that your team members have on the systems they use, the more confident and engaged they become. O365 products include, but are not limited to: Teams, OneNote, Planner, Flow, Outlook, Excel, Word, OneDrive, SharePoint, PowerPoint, Sway, Staff Hub, Delve, and more! With Premier training, we can create a more customized look and feel in your learning environment that can be designed more specifically to roles, systems, products, and your organization’s needs. This could include content such as welcome messages, on boarding processes, internal business requirements, and company communication. These can be delivered utilizing videos and/or documents that you produce, or our Training Manager can assist in content creation. Can videos and courses be tailored to match each user's need? Within our Learning Management System, our Training Manager is able to customize User Journeys and Skill Paths based on position, department, or courses specific to your organization’s needs. How long are the trainings at Greystone's Training Center? Our Individual Training Courses are anywhere from 1 hour to 2.5 hours in length. Can I see a list of courses that you teach on? Yes, we have our courses available here on our website, or fill out the form below and our Training Manager will send you our course descriptions. Do I have access to a real person to help customize our needs? Absolutely! Our Training Manager will be engaged throughout the whole process to help with customized training requests you may have. How often are the instructor-led classes available? There are live, instructor-led classes offered each month. 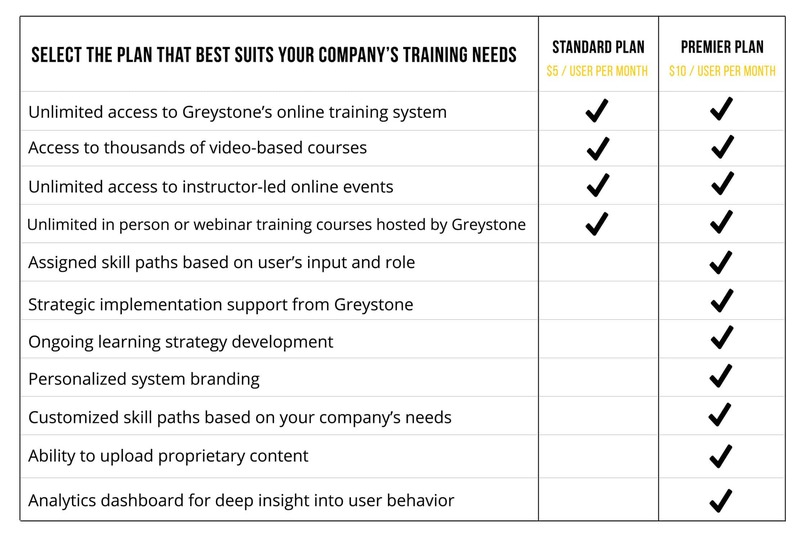 There are a few different opportunities for taking them: webinar courses through Greystone’s Training team, in person instructor-led courses at Greystone’s Training Center, and live webinars that your whole team has access to in the Learning Management System if you sign up for Managed Training. Is there a cancellation policy for the instructor-led classes? Live trainings are included in the Managed Training plans, however, to maintain availability we do charge a no-show fee for cancellations with less than 48 hours’ notice. Do I have to commit to a full year subscription? We do not require a 12 month commitment, however you must submit a written notice within 60 days to our Training Manager. Do I pay for this plan monthly or one time as an annual fee? Managed Training is billed per user/per month. I'm ready to learn more about managed training!